We’re delighted to report that Aurora was today announced as one of three winners of the Classical:NEXT Innovation Award. Presented at the closing ceremony of the annual Classical:NEXT Conference at De Doelen concert hall in Rotterdam, the prize highlights the most forward-thinking initiatives in classical music happening around the world. The winners are chosen by the Classical:NEXT global community of promoters, agents, record labels and performing ensembles. The Award was given to Aurora for its combination of outstanding musical performance and creative approach to concert programming and presentation. It recognises the artistic vibrancy and broad appeal of the orcherstra’s work for audiences of all ages, and in particular celebrates its pioneering work since 2014 in becoming the first professional orchestra to performing whole symphonies entirely from memory: a radical experiment in orchestral performance practice which has in the years since opened up a host of new musical, theatrical, and educational possibilities. 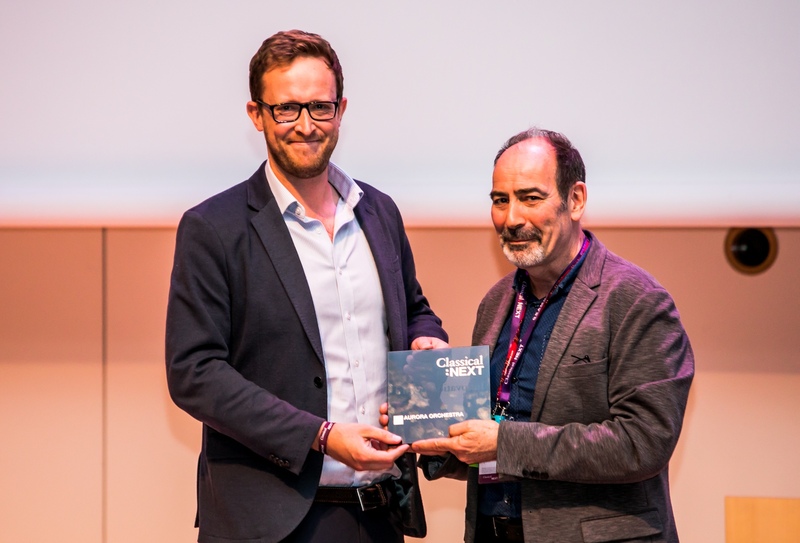 Accepting the award in Rotterdam, Chief Executive John Harte said: “I’m delighted to accept this award on behalf of the whole team at Aurora: it’s a wonderful way to end what has been a very inspiring and energising conference here in Rotterdam. The fact that winners are chosen not by jury but by thousands of our colleagues around the world makes it a particularly special prize, and we feel enormously honoured to have been shortlisted alongside such a distinguished list of organisations, each of which is doing hugely important work in building the classical landscape of the future. “I’d like to thank the many organisations and individuals who have supported our work over the years. That includes not only our many funders, big and small, but also the many artistic and promoter partners who have have helped catalyse our ideas and work. Particularly important examples are the wonderful programming teams at Kings Place and Southbank Centre, as well as our key regional venue partners in Bristol, Bury St Edmunds and Canterbury. I should also give a special vote of thanks to the BBC Proms team, who took a huge leap of faith back in 2014 when they offered us the chance to experiment with a large-scale memorised performance for the first time, and have encouraged us since in exploring the exciting realm of artistic and communicative possibilities which that initial experiment suddenly opened up. Former Classical:NEXT Innovation Award winners include Lucerne Festival’s Ark Nova, Buskaid Symphony, Southbank’s Centre’s The Rest is Noise Festival and Ensemble Resonanz. 2018 saw an orchestral focus, with the French talenschool App by Les Talens Lyriques and the Carbon-Free Lahti Symphony Orchestra from Finland being the other two winners next to aurora Orchestra.